Philadelphia Eagles….hate ’em, but this week not so much. The Eagles are the NY Giants contentious divisional rival. I am a huge Giants fans. My deep-seated feelings are inflamed by decades of the two teams battling on the gridiron twice each season. The Eagles had an incredible year and kudos for achieving the hard earned goal of Super Bowl champions. 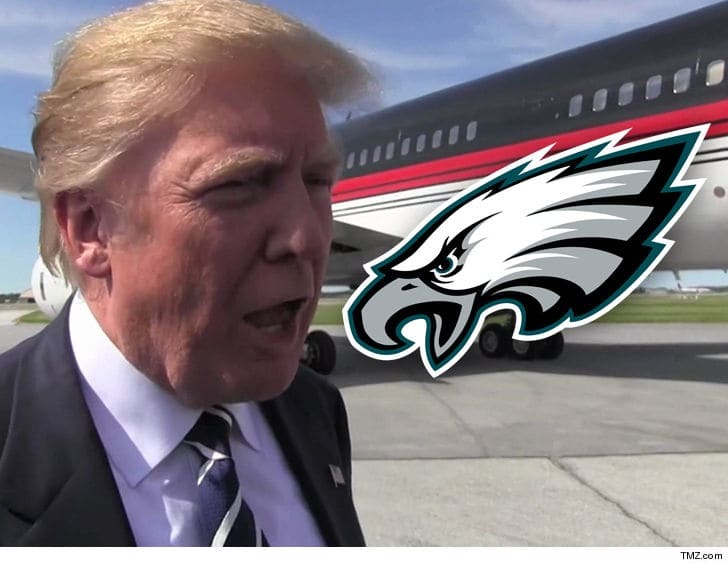 As difficult as it is to heap praise on the dreaded Eagles, I applaud the players for not attending the White House ceremony acknowledging their victory. Trump deflects and cancels the White House celebration while singing, “It’s My Party and I’ll Cancel If I Want To” because the egomaniac knows that, yet again, the crowd size would be minuscule. As usual, the U.S. self-proclaimed dictator has deflected and misrepresented the core of the issue. He creates a narrative when the truth is the l’il baby got mad because no one wanted to go to his party…waa! waa! The back story…NFL protests began in 2016 when San Francisco 49ers quarterback Colin Kaepernick silently knelt on the sidelines while the anthem played. Kaepernick’s protest was an effort to raise awareness around systemic racism and, specifically, the killing of black men by police. Here’s the truth of the matter regarding the Eagles…none of the Eagles took a knee during the anthem during the entire 2017 season. trump continues to spread the false narrative that players are anti-military. So, although it pains me, I wholeheartedly send a shout out to the Eagles. BTW, during the fake “Celebration of America” yesterday which was in place of the Eagle’s Super Bowl celebration, Agent Orange put himself front and center in the middle of the United States Army Chorus and did not know the words to God Bless America. The fact that the President of the United States of America does not know the words to “his” country’s patriotic theme song yet again showcases his ignorance. In the final analysis, humpty trumpty was sacked. Concussion protocol needed…oh, not necessary. I forget. he is always unfocused and out of step with reality. It’s actually “Fly, Eagles, fly” — from the (admittedly corny) fight song. But never mind; thanks for the shout-out! C’mon down next time we play New England or Dallas — the cheesesteaks are on me! I know it’s fly, but I just put my own twist on it…are Giants fans safe at Lincoln Financial?! Appreciate the cheesesteak offer. I look forward to breaking break with you! Hope all is well in your world.